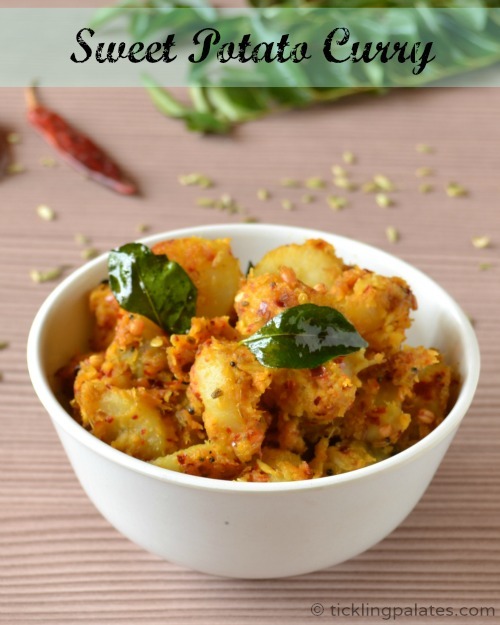 If you are on the look out for a sweet and spicy combination in a poriyal/curry for side dishes to rice, this is the recipe for you. As this curry is mildly spiced, the kids will love it. This curry tastes amazing and goes very well if had with a hot and spicy Kulambu rice. You can adapt the same recipe for good old potatoes as well but the taste will not be the same. 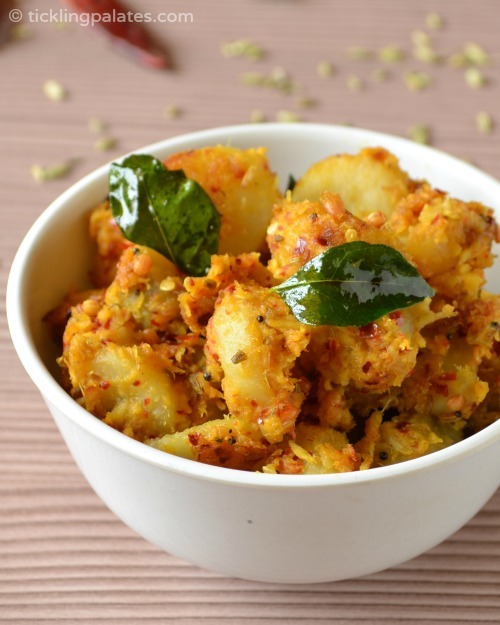 As the second most harvested crop next to Peanuts in my In-Laws place are sweet potatoes, the people of the town make varied recipes out of it and this is the one that I love the most as its a simple and quick side dish. 1. Wash and trim the edges of sweet potatoes. Pressure cook in enough water for 2 whistles over medium flame. After the pressure is released, let it cool. Peel the skin off and cut either into roundels or into large chunks and keep it aside. 2. In a mixie or in a food processor, place all the ingredients mentioned for grinding and using the pulse or whipper button grind to a coarse paste. If you feel that the ingredients are not getting ground, use just 1/2 to 3/4 tsp of water. 3. Heat a pan with oil. Add the mustard seeds and when they pop, add the urad dal and roast for 1 minute till it becomes golden brown. Now add asafetida and curry leaves. 4. Add the coarsely ground paste, salt and the sweet potato roundels, 2 tsp of water and mix well. 5. Close with a lid and let it cook over low flame. Mix in between. The mixture should cook from the steam released by it. If you feel the mixture sticking to the bottom of the pan, just add 1-2 tsp of water to keep it moist or 1-2 tsp of oil if you want the curry to be well roasted. 6. Let it cook for 5-7 minutes for all the flavors to merge together and the mixture becomes dry. 7. Take off stove and serve hot with Sambar or Kulambu saadam. 1. If you make this in a non stick pan, there is no need to add extra water or oil as you will not get the sticking to the pan problem. 2. If you want the curry to be well roasted, add 3-4 tsp of oil in step-4 and cook for extra 3-4 minutes over low flame. 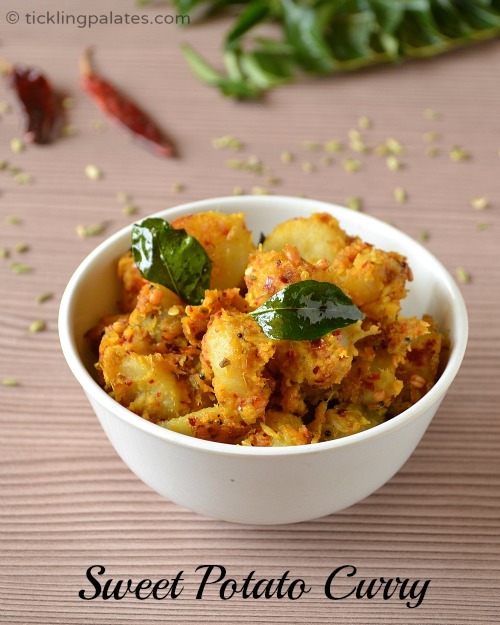 Amma makes this masala, she adds coriander seeds as well for taro root fry. Finger licking fry for sambar rice..
Been ages i prepared poriyal with sweet potato,makes me nostalgic. Looks delicious!, However, can we make it without coconut?